New car washing-house- Magic Wash has opened on September 20, at the beginning of Aghmashenebeli Alley, the concept of the place is to receive automatic, contactless service. A human is not involved in the process, special facility washes not just the surface, but also underneath of a car. The founders of startup are: Giorgi Nikoladze, Demetre Chkheidze, Irakli Giorgobiani and Nodar Kebadze. Marketer had an interview with Nodar Kebadze about the perspectives of business. What is the advantage of Magic Wash? What makes it different? 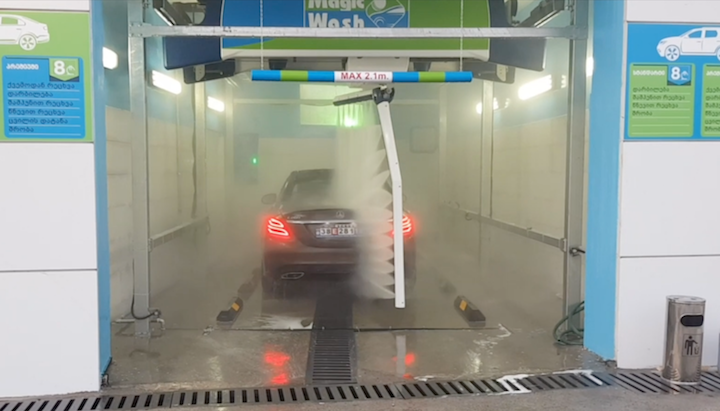 Magic Wash’s concept means contactless washing of automobiles. We don’t use human resource, a car is parked in the washing-house and robot facility makes it clean. It’s convenient as it’s being washed in every corner of the car, not just a surface, and all this in 5-6 minutes. Because of our facilities, there is no way a surface to be scratched. These are out advanced settings. How did you choose the location and what are the prices for the service? Magic Wash is located on the beginning of Aghmashenebeli Alley, as there is a big traffic. As for the prices, we offer two types of programs at this stage: in case of Sedan0 Standard-7 GEL, Premium- 8 GEL. As for Jeep, Standard- 8 GEL, premium- 9 GEL.